In our classroom management course this week we were talking about setting up classrooms that avoid punishment (punitive discipline). I had the opportunity to review the works of one of my favorite researchers, William Glasser. He was a great educational thinker and often stated that we will not improve schools unless we provide curriculum that is attractive to students, use nonpunitive discipline and emphasize quality in all aspects of teaching and learning. The portions of his research that had the most impact on me over the years are his standards for separating 'boss' teachers from 'lead' teachers. Boss teachers rely on what Glasser calls the 7 Deadly Habits: criticizing, blaming, complaining, nagging, threatening, punishing, and rewarding students to control them. I think we are all familiar with teachers that fall into this category. Rather than falling into the rut of being a 'boss' teacher, Glasser suggests that we become, 'lead' teachers. A lead teacher relies on the 7 Connecting Habits: caring, listening, supporting, contributing, encouraging, trusting, and befriending. The most successful classrooms are the ones led by lead teachers. I have told my student teachers that if they start using one of the deadly habits, combat the temptation with one of the connecting habits. Our goal is to be lead teachers and provide a nurturing atmosphere for the students. I'm always jealous of people who live in climates that are more mild during the winter (I don't enjoy cold much any more). However, one of the things I love about our climate is the wonderful colors that we see during the autumn. Since we are surrounded by mountains, it is a lovely site to see. We live at the base of a mountain and it is amazing to watch it change daily. I remember all of the fall activities that I did in the classroom using those leaves. I remember when another teacher told me about leaf glitter. I laughed thinking it was a weak idea. Then I watched what happened when I crumbled leaves and allowed the children to use the crumbs just like they would use glitter. They were thrilled and we had to continually make more! Who knew such a simple idea would be such a hit. The biggest plus was that it was so much easier to clean up than regular glitter. 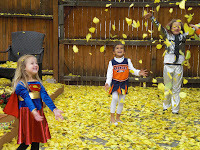 Those of you who are surrounded by the colors of autumn and work with young children, make the most of this time of year. For those of you who live where leaves don't do much changing, I'm sorry. You can give me a rough time during the winter when you are having a picnic.